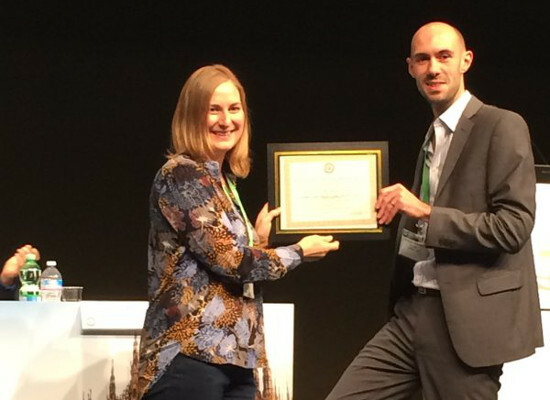 Dr Alison Pearce has won a Best New Investigator Presentation Award at the Annual European Congress of the International Society for Pharmacoeconomics and Outcomes Research (ISPOR). The award recognises the scientific merit of a podium presentation at the conference, which was held in Milan, Italy. The award was given for Alison’s work which found that lost productivity due to cancer in Brazil, Russia, India, China and South Africa costs around $47 billion US dollars annually. When people die from cancer, their contribution to society through paid work, called productivity, is lost. Over 70% of cancer deaths in the world occur in developing countries, and Brazil, Russia, India, China and South Africa (the BRICS countries) are the most rapidly developing economies in the world. The results highlight the importance of tobacco control, vaccination for hepatitis, and improved access to early detection and treatment in developing countries. The National Cancer Registry is leading this research with a group of collaborators from around the world, including the International Agency for Research on Cancer (IARC) in France and researchers in Ireland, the UK, Brazil, Russia, India, China and South Africa. ISPOR is a non-profit, international, educational and scientific organisation that promotes health economics and outcomes research excellence to improve decision making for health globally.